60 Days In TV show photo by Zach Dilgard. Copyright 2016. The second season of the 60 Days In TV show premieres on A&E, Thursday, August 18, 2016 at 9:00pm ET/PT. 60 Days In features Sheriff Jamey Noel and Captain Scottie Maples of the Clark County Jail and ordinary citizens, posing as inmates, to get the inside scoop on the correctional facility. 60 Days In is produced by Lucky 8 TV for A&E Network. Executive producers for Lucky 8 TV are Gregory Henry, Kimberly Woodard, and Jeff Grogan. Executive producers for A&E Networks are Elaine Frontain Bryant, Shelly Tatro, Drew Tappon, and Brad Holcman. Here is the A&E press release with further details. NEW YORK, NY – MAY 25, 2016 –The #1 new non-fiction series “60 Days In” returns for an explosive second season following the success of its inaugural season. “60 Days In” is cable’s #1 new non-fiction series among total viewers and adults 25-54 and 18-49 – further bolstered by the season finale which garnered more than 3.1 million total viewers (based on Live +3). 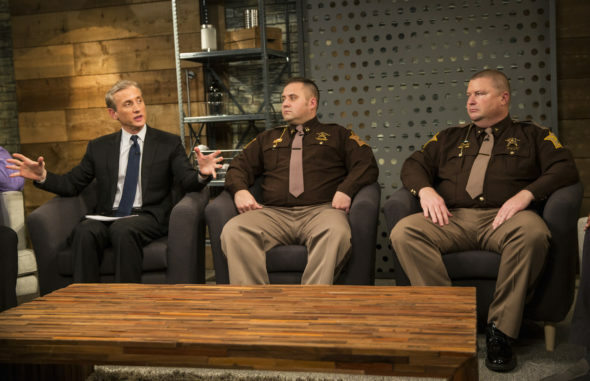 Sheriff Jamey Noel of the Clark County Jail decided to nominate eight new innocent participants with an interest in the criminal justice system to enter the program for a deeper dive into the drugs, violence and internal corruption exposed during season one. The second season of “60 Days In” will premiere on Thursday, August 18th at 9 p.m. ET/PT. ABC News Chief Legal Analyst, Dan Abrams hosts “60 Days In: The Aftermath,” a tell-all reunion special, with the season one participants premiering on Thursday, May 26th from 9-10:30 p.m. ET/PT. See some of the participants meet for the first time, learn specific details about their experience and hear critical feedback on how they did from Sheriff Jamey Noel and Captain Scottie Maples. Finally, during “60 Days In: Meet the Participants” premiering on August 11th at 10p.m. ET/PT, viewers will get to know the new group from season two and their individual reasons that led up to their decision to enter this dangerous program. Meet the wife of season one participant Zac in addition to a former corrections officer, a mother with an incarcerated child, a bounty hunter, a criminal justice student and a young lawyer. Each participant’s background will help give the sheriff more well-rounded feedback. More than one hundred cameras captured unparalleled access around-the-clock, documenting the participants’ every move as they lived among the facility’s general population without anyone knowing their secret. “60 Days In” gives viewers a first-hand look at the dangerous world of incarceration as the participants adapt to terrifying new surroundings and aim to shed light on local and national issues within our corrections system. The Clark County Jail houses approximately 500 prisoners, from inmates charged with drug dealing to first-time offenders to capital murder. The participants’ safety was top priority, so Sheriff Jamey Noel re-implemented the program before the first group completed their time and before any jail staff were made aware of the program. This strategic approach made this set of participants’ time in jail equally as authentic and even more shocking for the facility’s officers and staff upon reveal of the two-time program. Season one of “60 Days In” has been embraced by over 100 territories worldwide on A&E and Crime & Investigation Network™. “60 Days In” is produced by Lucky 8 TV for A&E Network. Executive producers for Lucky 8 TV are Gregory Henry, Kimberly Woodard and Jeff Grogan. Executive producers for A&E Networks are Elaine Frontain Bryant, Shelly Tatro, Drew Tappon and Brad Holcman. Now reaching more than 92 million homes, A&E is the home to quality original content that inspires and challenges audiences to BE ORIGINAL. A&E offers a diverse mix of uniquely immersive entertainment ranging from the network’s original scripted series, including “Bates Motel” and “Damien” to signature non-fiction franchises, including “Duck Dynasty,” “Wahlburgers” and “Storage Wars.” The A&E website is located at aetv.com. Follow us on Twitter at twitter.com/aetv and Facebook at facebook.com/AETV. For more press information and photography, please visit us at press.aenetworks.com. What do you think? Are you a fan of the 60 Days In TV series? Do you plan to check out the second season on A&E? More about: 60 Days In, 60 Days In: canceled or renewed?, A&E TV shows: canceled or renewed? Just watched the all of season 1. All participates were great except Robert who didn’t seem to grasp the concept of the show or much of anything else. Regarding Jeff, well seems to me he wants to be a correctional officer so he can finally be in charge of bullies.